Organic raised bed gardening using this easier raised bed provides a rich soil for your gardening without the digging. An easier raised bed is appealing to self reliant gardeners. Those who are homesteading usually have a lot on their plates besides gardening: animals to tend, repairs to make and countless others chores to finish, so they naturally want things as simple as possible. But this marvelous system is also ideal for the elderly, children or anyone who just want their gardening to be a little simpler. Patricia Lanza described this simpler way of preparing soil for organic gardening in her wonderful book, Lasagna Gardening. While fall is the perfect time to prepare these beds  giving your organic materials ample time to break down before spring planting  you can also prepare them a week or so before planting. If you do prepare your beds in the spring, go easy on matter that is high in nitrogen like alfalfa hay or fresh grass clippings. Otherwise the nitrogen will heat up the temperature inside your pile and could burn the roots of your plants. These wonderful, easier raised beds provide ideal growing conditions for your plants so they become strong from the inside out. That will mean fewer pests and diseases. All that organic matter holds in the moisture, which means less stress on your plants, and because the beds are raised, their roots are not as likely to become waterlogged. Also, people are less likely to step on a raised bed, so the soil does not become as impacted. First, you will want to stake off your area. The easiest way is to use wooden stakes and string. Once your area is marked, stomp down all the grass and weeds and then layer the area with wet newspaper. It is important to wet the newspapers thoroughly so they dont blow away in windy weather. You are going to need a lot newspapers so don't skimp in this area. You will need enough paper to block out the sunlight so the grass and weeds that are underneath the newspapers die. To keep the grass and weeds from sneaking through, overlap the edges of the papers. The wet newspapers will provide a dark, moist area that will attract earthworms to this easier raised bed. These lovely little insects will tunnel through all your organic matter and convert the different layers into rich garden soil. This easier raised bed method is called lasagna gardening because just like in lasagna, you add different layers for an easier raised bed. For the layers you put on top of the newspapers, you can add grass clippings, straw, spoiled hay, composted kitchen waste, shredded office paper, leaves or leaf mold, wood ashes, or pine needles. Materials such as leaves and pine needles will need to be chopped by a shredder or your lawn mower. For really healthy soil, consider adding worms to your garden. They will break up the soil and enrich it with their own wonderful worm manure. Vermiculture, or using worms to make compost, is a smart way to build your garden. You can also add manure, but make certain it is composted first before adding it to your easier raised bed to keep it from introducing harmful bacteria to your soil. If it still smells, don't use it. Keep alternating the materials until you have an easier raised bed that is the desired height. 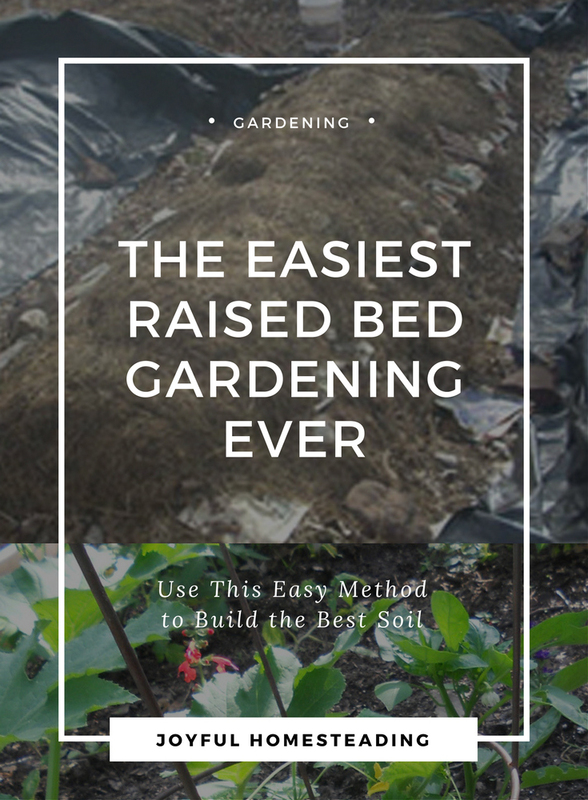 How high you want your bed will depend on what you plan to plant. For example, tomatoes will need a bed of at least twelve inches, while lettuce and radishes will need a much shallower bed. 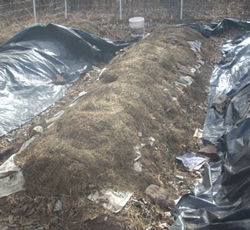 Coarser materials, such as hay will compact as they decompose, so if you use a lot of these items, make your bed a bit higher. Once your bed is high enough to suit, cover it with black plastic, and weigh the plastic down with rocks or bricks on the edges to hold it in place. The black plastic will absorb heat from the sun and increase the temperature of your bed, cooking everything nicely. If you make your bed in the spring, the warmer outside temperatures will cook your bed much more quickly. If you build your bed in the fall, keep the plastic on it until early spring. The great thing about these easier raised beds is you don't need to dig to plant. Instead, just pull the layers aside, put in your plant and push material around the stem. If you have a shallow bed, never cut into the newspaper. Instead, gently pull the roots apart, fanning them in different directions and set them directly on the newspaper. That way the roots will stretch out laterally and your plants will get lots of wonderful nutrients. Your vegetables will be strong, healthy and provide you with a bountiful harvest. Happy organic raised bed gardening!